Combining skincare luxury with cutting edge innovation, Institut Esthederm aims to re-educate your skin and help it to maintain its optimal state. At the heart of each formula is its unique Cellular Water, created to replicate water found naturally in the skin, which boosts skin’s vital functions and cellular activity. So, if you’re new to this super-powered brand, where is the best place to start? 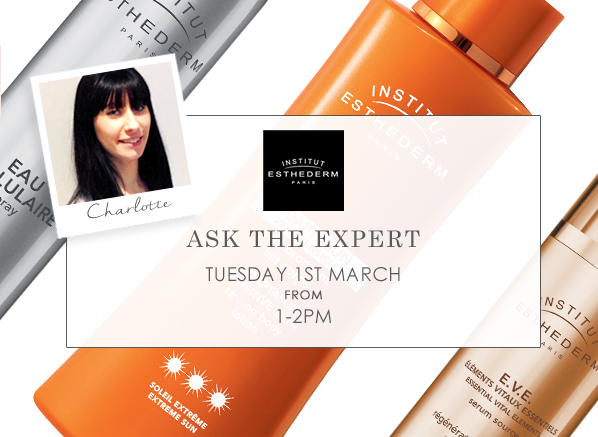 UK Account Manager and Trainer for Institut Esthederm, Charlotte Dibon, will be here this Tuesday 1st March to answer all of your questions. If you can’t make that time, simply leave your question below and Charlotte will answer it on the day! The best question will win the Institut Esthederm product of their choice. Best of luck! No purchase necessary. A purchase will not improve your chances of winning. Contest ends 1st March 2016. Winner will be selected at random on or around 1st March. One prize winner will receive one gift set selected from the list above. If the winner doesn’t respond within 7 days, the competition will be redrawn. Prizes must be accepted as awarded; not redeemable in cash or credit. This entry was posted on Friday, February 26th, 2016 at 4:26 pm and is filed under Ask The Expert, Skincare. You can follow any responses to this entry through the RSS 2.0 feed. Both comments and pings are currently closed.